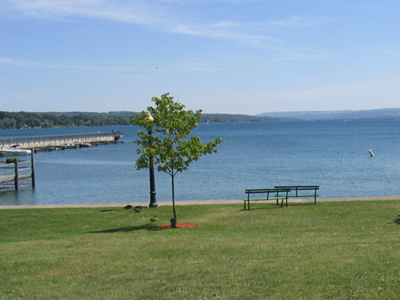 The City of Syracuse draws water from Skaneateles Lake, one of New York State’s Finger Lakes, for its public water supply, and has required technical assistance in support of their filtration avoidance under the provisions of the Safe Drinking Water Act. In the mid-1990s, Dr. Elizabeth Moran brought together an expert team of limnologists, hydrodynamic modelers, and aquatic sediment specialists to work with the city on designing a field and laboratory program for identifying potential sources of contamination, developing a numerical model to move water and particles in the lake basin, and developing long-term and short-term management strategies for protection of this high quality water supply. In 2003, EcoLogic staff completed a permitting strategy report for the city that included data collection and analysis of potential environmental and permitting issues associated with extending the city’s water Intake No. 2 to deeper water. Biweekly water quality sampling, sediment testing, and a survey of aquatic habitat were included in this project. EcoLogic has continued to provide technical assistance to the city in analyzing and interpreting water quality data.